A brand new A47 could be built to replace the existing road to improve safety and congestion problems. Residents are being given the chance to have their say on proposals to dual the busy road between Wansford and Sutton, with three options on the table. Two of the plans would see new roads built alongside the current stretch, while the third would see work carried out to turn the existing road into a dual carriageway. The Highways Agency, who are carrying out the works, said the project was important to reduce the ‘bottleneck’ of traffic at the junction, and also improve the ‘poor safety record’ on the road. Work to build a new road would mean land would have to be purchased, possibly on both sides of the carriageway. Residents and motorists are being urged to have their say on which scheme they want to see, before a final decision is made in the autumn. A series of consultation events are being held, and plans and proposals have been put online so comments can be made. Debbie Queen, General Manager at Sacrewell Farm - which lies next to the road where works will be taking place - said she was confident the farm would continue to be able to grow while works take place. She said: “As this is very early in the consultation phase, this will obviously be an on-going process for all of the stakeholders, including the William Scott Abbott Trust who own Sacrewell Farm. “We, along with others, will be attending the public exhibition hosted by Highways England to find out more about their proposals. “The William Scott Abbott Trust is a charity that has operated Sacrewell Farm for over 50 years, focusing on farming and countryside education for all ages. Highways England Senior Responsible Owner for the A47, Philip Davie, said: “The dualling of several sections of the A47 will make a real difference to all our users on this road, as well as the economy by providing safer, more reliable and less congested journeys. “There are important decisions to be made, and now we’re keen to get your views on the A47 to help us reach these decisions. I encourage anyone with an interest in the A47 to come along to one of our consultation events and check out the consultation materials online”. The works are part of £300 million works taking place on the A47 between Peterborough and Lowestoft. They are due to start in 2020, and finish two years later - but the details of the cost and exact length of times the works will take to complete will be revealed when the chosen proposal is revealed. There is also a plan to improve the junction at Guyhirn, by making the traffic island bigger. The proposal - the only one on the table - would see the roundabout expanded to include three lanes, and the widening of the carriageway on the River Nene Bridge. 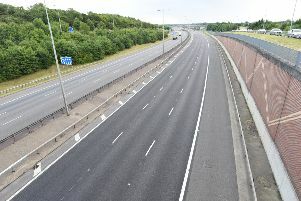 Peterborough MP Stewart Jackson said the scheme would be a great benefit to drivers - but more needed to be done. He said: “I think the Sutton to Wansford dualling project is obviously welcome and much needed and will tackle the problem of congestion to the west of Peterborough. North West Cambridgeshire MP Shailesh Vara added: “The long-awaited upgrade of the A47 between Wansford and Upton will remove a significant pinch-point which is not only a source of frustration, but is also a significant safety risk. “Highways England has launched its public consultation and has three different models for how the route may be upgraded. “For my part, it is important that whichever scheme is chosen strikes a balance between affordability and the protection of the environment at either side of the current road. The work on the A47 is part of a £15 billion investment in A roads across the country from the Government, with £3 billion staying in the East of England. Residents will be able to have their say on all the proposals at a series of consultation events. The first, for the Guyhirn island scheme, takes place at Wisbech St Mary Sports and Community Centre today (Thursday 16 March) between 3pm and 8pm) and at the same venue on Saturday 18 March between 10am and 3pm. There will also be a session at Guyhirn Village Hall on Friday, March 17 between 10am and 5pm. For the dualling scheme, there will be events at the Haycock Hotel, Wansford, on Thursday, March 23 between 3pm and 8pm, Sutton Church, on Friday 24 March between 10am and 5pm and Sacrewell Farm Centre, on Saturday, March 25 between 10am and 2pm. The information is also available at www.highways.gov.uk/a47improvement or by clicking here as well as March Library, Wisbech Library and Peterborough Town Hall. The deadline for comments is midnight on Friday, April 21.